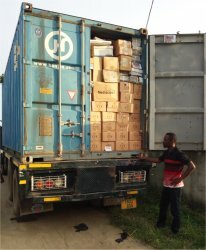 Thanks to Steve Schmidt of Eagles Nest Ministries, USA, for the Love Packages sent to Africa through United Caribbean Trust the container arrived in Tazania and was transported down to Mbeya and on to Karonga in Northern Malawi. 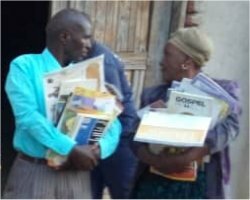 These were distributed through the African Training Bible School network of Pastors in Malawi. 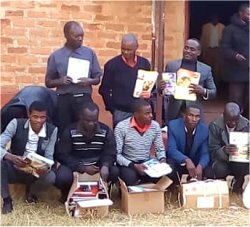 Thanks to Steve Schmidt of Eagles Nest Ministries, for blessing these Pastors in Malawi. 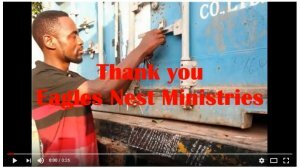 View our short video from Pastor Sam from Malawi, expressing his gratitude for the books and Bibles given to him from Eagles Nest Ministries, distributed by United Caribbean Trust. How lovely to see Pastor Sam on video again, a retired Principle of a school who is so committed to teaching children the meat and deeper truths of God’s Word by going beyond the basic Bible stories. 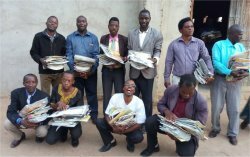 The Karunga, Malawi KIMI three day PowerClub leadership training in 2011 resulted in 79 new PowerClub leaders being produced and 30 new PowerClubs birthed. 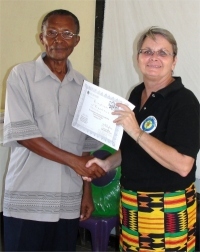 Seen here Pastor Sam receiving his KIMI certificate from Jenny Tryhane at the end of the Karunga three day KIMI training.